The Levites receive towns and pasturelands as their inheritance out of the other tribes’ promised land as the Lord had commanded through Moses. They received a total of 48 towns scattered about within the other tribes’ land–4 from each tribe. Every promise of God was now fulfilled as all of Israel took possession of the Promised Land and all the Israelites’ enemies fell. 13) The Levites were the priests to the people who were to be dispersed amongst the people in order to instruct the tribe in the law and lead worship, so that all can hear God’s word. Remember, no one could read in ancient times but the priests. The people only knew of God from them. 14) 1 Peter says our inheritance “can never perish, spoil, or fade–and it’s kept in heaven for you, who through faith are shielded by God’s power until the coming of the salvation that is ready to be revealed in the last time.” The deposit is the Holy Spirit as Ephesians says was given to us as a gift from having believed in Christ as our salvation, which guarantees our inheritance (heaven and eternal life) until the Last Days. 15) Part personal Question. My answer: God keeps His promises–all of them. God is with me no matter what, directing me, taking care of me, fulfilling my every need. He is there, helping me in all my trials. He is the hope we all need. I love how God is there in the details (the allotting of land) as much as He’s there in the big picture (the taking of the Land). I love how this ends: With all of God’s promises fulfilled. Such hope. Even though it took 40 years. It’s all in God’s timing and not ours. Patience and He will do what He says He’ll do. 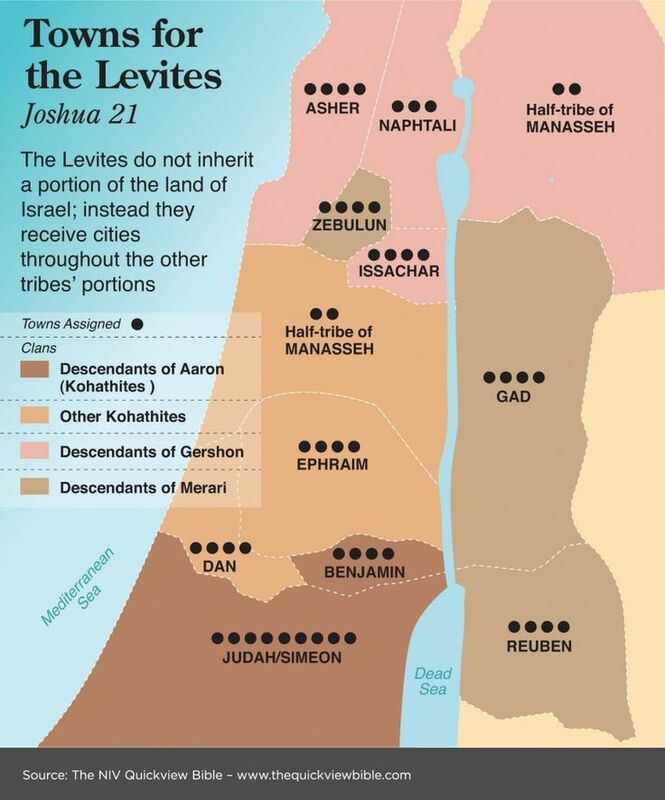 God would be the Levites’ inheritance (Joshua 13:14, and 13:33). The Levites are the only ones without their own land and together. God wanted the Levites “sprinkled” all throughout the land of Israel. He never intended there to be one “state” of Levi, but every tribe was to have the priestly influence and presence in their midst. In the same manner, Christians (being priests, 1 Peter 2:5 and 2:9) are to be “sprinkled” all throughout the world and society, instead of heading off to make a “Christian country” somewhere. Further note the Levites or the priests received their cities last of all the tribes. Priests are appointed to serve, not to be served, and there is something priestly about letting others go first. Historical Notes: This is the point where Israel stopped commemorating Passover as if equipped to travel as described in Exodus 12:11). Now they will eat the Passover reclining at rest (as described in John 13:23) because the LORD had given them rest in the land. Any failure to fully possess the land was not because God had not made adequate provision, but because Israel had failed to fully follow the LORD. Ask yourself: God has been completely faithful to you and made provision for continual victory. He has given greatly, but what do you possess?